The Additional Chief Secretary to Govt. 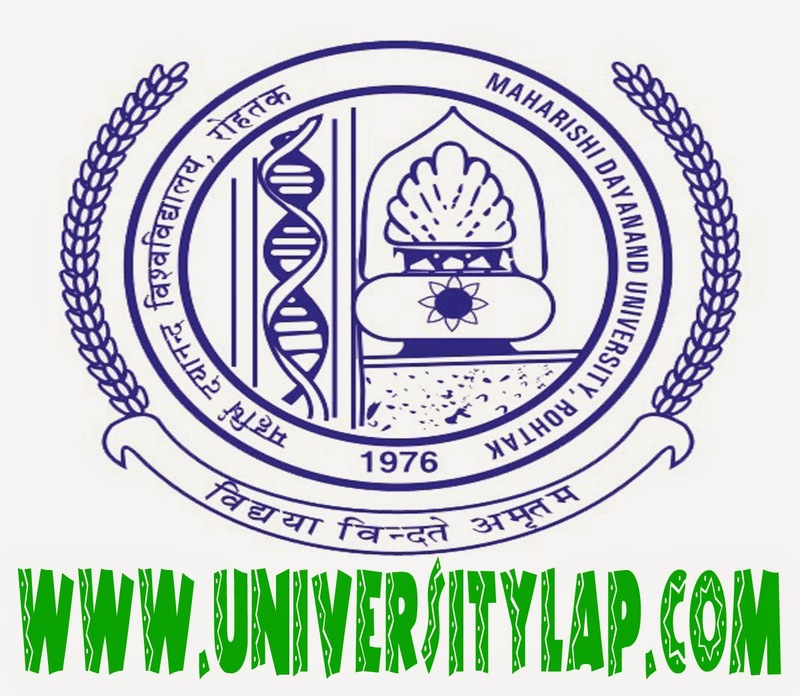 of Haryana, Higher Education Department, Chandigarh has declared the M.D.University, Rohtak as competent Authority to conduct State level Centralized Counseling for admission to B.Ed course (regular) in Colleges of Education situated in the State of Haryana for the academic session 2014-15, vide memo No. 18/322-2008UNP(3) dated 20.06.2014. 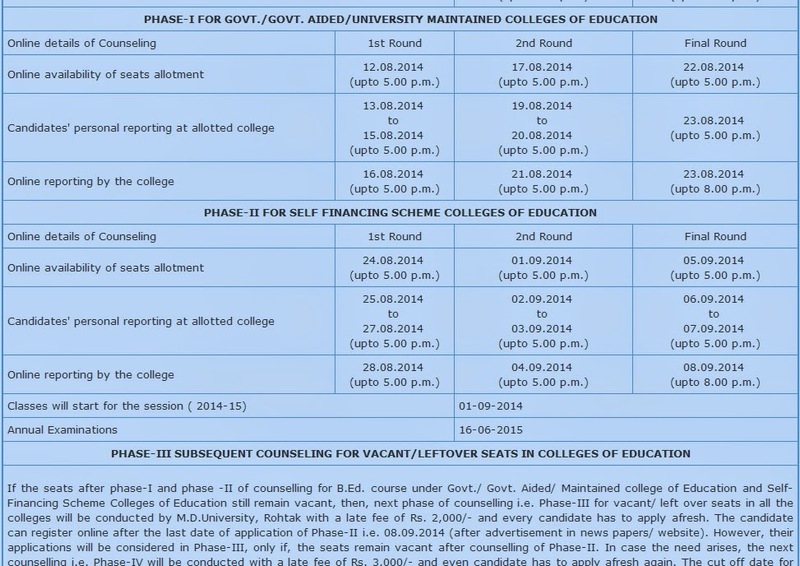 If the seats after phase-I and phase -II of counselling for B.Ed. course under Govt./ Govt. Aided/ Maintained college of Education and Self- Financing Scheme Colleges of Education still remain vacant, then, next phase of counselling i.e. Phase-III for vacant/ left over seats in all the colleges will be conducted by M.D.University, Rohtak with a late fee of Rs. 2,000/- and every candidate has to apply afresh. The candidate can register online after the last date of application of Phase-II i.e. 08.09.2014 (after advertisement in news papers/ website). However, their applications will be considered in Phase-III, only if, the seats remain vacant after counselling of Phase-II. In case the need arises, the next counselling i.e. Phase-IV will be conducted with a late fee of Rs. 3,000/- and even candidate has to apply afresh again. 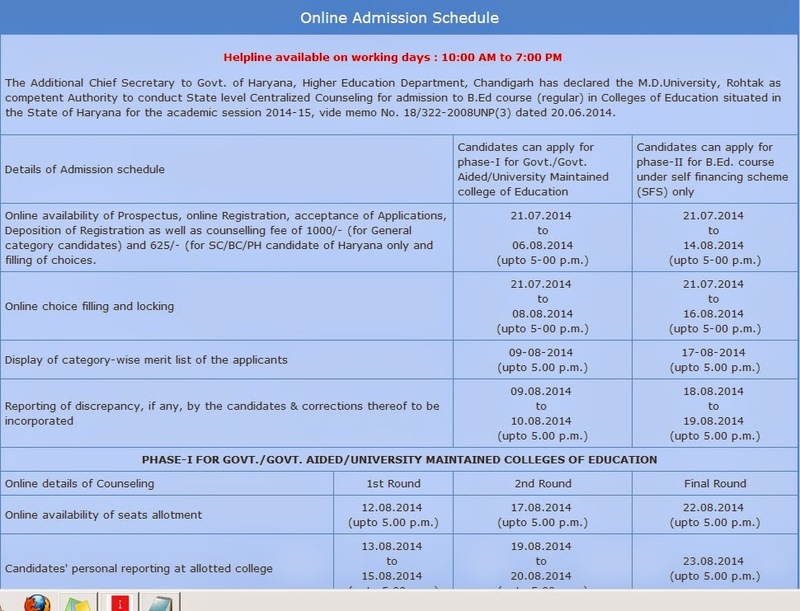 The cut off date for last admission will be 15.10.2014 in all respects. The schedule for filling up these vacant seats will be displayed on the website and will also be notified in two national dailies. Cut off date for eligibility will be the last date/time of online choice filling. Note: After subsequent counseling for vacant/leftover seats in colleges of education, no further counselling shall be conducted by the University for admission and no college shall be allowed to make admission beyond 15.10.2014 even if seats remain vacant, to meet the minimum requirement of 200 days compulsory teaching as per NCTE norms.